Happy New Year! The coming year will certainly present its challenges, but I am confident that things will get better, even if that's only because it doesn't seem like they can get much worse. I don't really make resolutions for the new year, but it does seem like a good time to take stock and start fresh. I am taking a page from my niece's book and setting goals for the coming year, rather than making resolutions I know I will break. Among my goals are to walk more and to eat more healthfully. I have been walking every day since I got to Austin and I plan to continue that habit once I get back to Chicago. I have also been inflicting some of my healthier recipes on my family down here. They seem to be enjoying them and that makes me happy and keeps me motivated to keep cooking them. 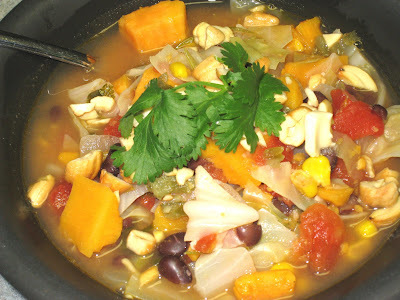 If you are looking to start the year on a healthy note, you can't go wrong with this Caribbean Vegetable Stew. It's spicy and sweet and loaded with all kinds of vegetables that have all kinds of good things in them. The original recipe called for okra and had no corn, but the combination of flavors seemed to call out for corn so I switched them around. The beauty of this dish is that you could pretty much add any vegetable that you like, and omit any that you don't want. This makes a big pot of good. When I am cooking for myself, I immediately freeze half of it so I don't get tired of it. I am happy to say that with my brother's family it didn't last long enough to be a problem. Heat oil in 4-quart casserole or Dutch oven over medium heat. Add the onions and garlic and saute, stirring frequently, 2-3 minutes. Add cabbage, wine, serrano, red pepper flakes, and ginger. Continue to saute, stirring frequently, for 10 minutes. Add vegetable broth and sweet potatoes. Bring stew to a boil, reduce heat to simmer and cook, partially covered, 10 minutes. Add tomatoes, salt, several grindings of pepper, and lime juice. Simmer for an additional 15-20 minutes, until vegetables are tender. Stir in the corn and black beans and simmer until they're heated through. Taste for seasoning and stir in the cilantro. Top each serving with a sprinkling of chopped cashews.